Easyjet has abandoned talks to join a consortium that would have bid for Italian carrier Alitalia. The budget airline had been considering teaming up with Italy's state-controlled railway Ferrovie dello Stato Italiane and Delta Air Lines of the US. Alitalia was went into administration in May 2017 after workers rejected a plan to cut jobs and salaries. The airline continued to operate, propped up by the government, which has been looking for a buyer. 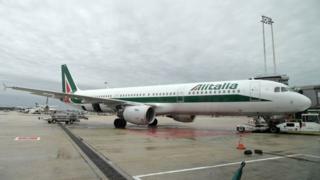 The three parties had entered discussions in February about potentially forming a consortium, although at the time Easyjet said it was not certain whether a transaction for Alitalia would materialise. Delta remains in talks with Ferrovie: "Discussions remain ongoing as Alitalia is a long-standing partner of Delta," a statement from the US airline said. The Italian government has set an end-of-March deadline for the two to come up with a rescue plan for Alitalia. Meanwhile, EasyJet said Italy would remain a big market for the airline. "EasyJet remains committed to Italy, as a key market for the company, where it currently carries 18.5 million passengers every year and employs 1,400 pilots and crew, all on local contracts," the firm said in a statement. Rome-based Alitalia has been the recipient of a £789m state loan and has been looking for international partners to keep it in business. Irish budget airline Ryanair had expressed an interest in Alitalia shortly after it entered administration two years ago, but quickly said it was dropping the idea. At the time the Irish airline was struggling to contain the fallout from a pilot shortage, which led to the cancellation of flights for about 700,000 passengers.